This Ketubah is enriched with symbols of Jerusalem, the city of the Jewish tradition as well as the city where the artist lives and works. Its elegant shape and intricate design make it unique. It is 19" x 22" and it is a papercut. 19" x 22"
In this classic architectural border, midnight blue panels are the backdrop for vibrant floral vines. Drawings in warm tones above and below create a compelling balance of dark and light. 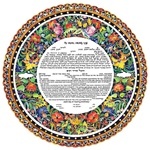 This Ketubah text is surrounded by a vibrant, colorful wreath of papercut flowers which are beautifully complimented by the delicate papercut border. 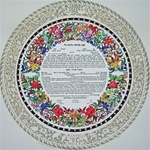 The ketubah is 16.5" by 16.5". Colorful spring flowers are surrounded by a delicate papercut border. delicate papercut border surrounds brightly colored rings of lattice, flowers and scenery with gold leaf pyramids and accents.